Other novels in "The Necromancer Chronicles" - "The Drowning City"
Death is no stranger in the city of Erisín-- but some deaths attract more attention than others. As a sorcerous plague sweeps the city and demons stalk the streets, Isyllt must decide who she's prepared to betray, before the city built on bones falls into blood and fire. Only one thing can look more frightening than a huge to-be-read pile of books, the list of started series that are still waiting to be finished. The two things also seem to be in a directly proportional relationship. Among my discontinued reading series is Amanda Downum’s “The Necromancer Chronicles”, left a bit forgotten after its initial novel, “The Drowning City”. Until now, when after a quick scanning of my personal bookshelves came back into attention through the second novel, “The Bone Palace”. And since I wish to catch up on all the series I started but that are still waiting to be brought to date I picked up the copy of Amanda Downum’s “The Bone Palace” after the mentioned bookshelves scanning. The story of “The Bone Palace” takes place after a couple of years from the events of “The Drowning City” and is placed in Erisín, the home town of the common main character of both novels, the necromancer Isyllt Iskaldur. The two stories do not hold many connections, besides the character around which they are developed the events of “The Drowning City” are scarcely mentioned, without any importance for the development of “The Bone Palace” plot. There are a couple of elements connected to the main character that are in strict relation with her adventure in “The Drowning City”, but they are only a fleeting presence and do not bring any hindrance to a reader unfamiliar with Amanda Downum’s debut novel. In this matter “The Bone Palace” can easily be approached as a stand-alone adventure as well. However, as a common ground we can find the ability of Amanda Downum to build a powerful and vivid setting. Erisín is a construction approached from its physical side as well as its immaterial one. Architecture, public spaces, transport, landscape and urbanization raise the city to a three-dimensional scale. History, traditions, vestments, laws, social, political and military structures inflict further solidity in the city of Erisín making it a very intense and expressive setting. Another element that makes Erisín such dynamic setting is its placement within surroundings. A world exists outside Erisín’s city limits and that is felt throughout the entire story. Not because some of the key characters travel outside the city, after all that particular journey is short and not sufficient for this task on itself, but because the same elements that make Erisín a rich setting are touched to a certain point in this case too. Erisín is certainly a vivid setting, but it is also a very dark one. Ghosts, demons and vampires are part of the city life as much as is its population and they cause as much mischief as their human counterparts. With an additional contribution of two constantly spreading plagues the dark picture of Erisín is complete. On this background Isyllt Iskaldur must investigate the murder of a prostitute that ultimately leads her to a conspiracy. To the same conspiracy is led Savedra Severos, the prince’s mistress, through a series of assassination attempts. Together, Isyllt and Savedra follow a plot with roots burrowed deep in the past, full of intrigue, sorcery and betrayal. The story comes with plenty of action and suspense in fairly balanced pace. 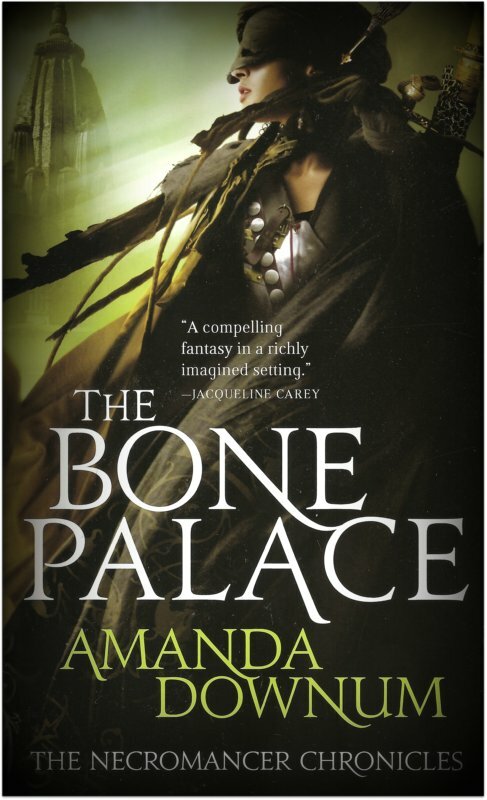 There is plenty to be found in “The Bone Palace”, a rich and dark setting, an interesting intrigue and well drawn characters, with an emphasis on Savedra Severos who offers a captivating and original perspective of a character in a fantasy novel. But I did have a problem with the novel though. There are throughout the pages of “The Bone Palace” so many romantic combinations that they are truly worthy of a soap-opera. Even more, the confrontation between the three lovers of a romantic triangle and the conclusion the trio reaches can put those soap-opera to shame. Especially when the twist and impact that conclusion has on the political scene of “The Bone Palace” is taken into account. Amanda Downum’s debut novel, “The Drowning City”, didn’t feel as a strong novel despite its good points. “The Bone Palace” however enforced the good points of the previous novel and mixed them with the solid elements of its won. It is definitely a more robust novel that shows clear signs of development in Amanda Downum’s writing. It is also a very good advertiser for the next installment in “The Necromancer Chronicles”, “Kingdoms of Dust”. I've been meaning to read this series for a while now . . . thanks for putting it back on my radar.